While the future of Friday the 13th: The Game is apparently closed for good, what could be seen as its direct competitor continues to thrive with new content just released for Dead by Daylight. The new “chapter” (what they call each of their DLCs) is called Curtain Call, and for the first time since July of last year the killer included is an all original creation (unlike the last several DLC chapters, which included licensed killers from popular slasher films). 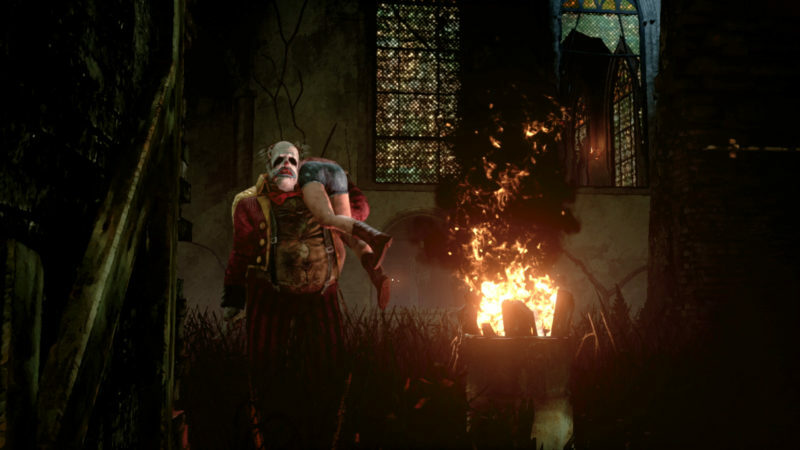 The new killer is The Clown, who uses a more strategic play style designed to “control and corral Survivors by throwing bottles of The Afterpiece Tonic to create clouds of noxious gas that cover large areas for a short amount of time. Survivors intoxicated by the gas are inflicted with impaired vision and movement speed, and give away their location by coughing loudly” according to the DbD wikia page on him. Along with The Clown, we also have a new survivor, Kate Denson. Kate is an “easy” type survivor and her perks include not leaving the characteristic scratch marks for three seconds after vaulting or escaping a locker, the ability to see pallets in a 20 meter range, and stronger struggling effect against the killer while also obscuring the aura hooks create to the killer within up to 24 meters. The new map is Father Campbell’s Chapel (perhaps a nod to the King?) and is a dark and ominous church setting, with the Clown’s disturbed caravan set up outside. Feature – Added an in-game Store to purchase characters and cosmetics. The store now also hosts the Shrine of Secrets. Feature – Added the Player Level functionality. This is an account based progression that rewards the player with Iridescent Shards upon leveling up. Feature – Updated the main menu and player loadout button layouts to accommodate for the newly added Store and Tutorials. Adding in tutorials is a pretty awesome one for sure, and I’ve gotten the chance to play with the new menu and level up changes. After the disheartening news about F13, knowing how strong at least DbD is still is a very welcome piece of news. I’ve actually grown very fond of DbD and even picked up a second copy for myself to play on PC (previously only played on Xbox). We’ll keep you updated as more content gets announced.